As the 19th century drew to an end, Charles I. Hudson was doing well for himself. He had formed the brokerage firm of C. I. Hudson & Co. with partner Albert H. De Forest in 1885, had garnered a substantial fortune, and lived with his family in a handsome home at No. 36 West 52nd Street. In 1894 he was one of the millionaire founders of the Thousand Islands Club, a private summer community “which embraces in its membership a number of well-known New-Yorkers,” as described by The New York Times. Now, in 1898 like many other wealthy New Yorkers, Hudson looked to move uptown near Fifth Avenue and Central Park, away from the encroaching commerce. He purchased the lot at No. 1 East 76th Street and laid plans for a fine new mansion. His choice of architects is a matter of contention. The Real Estate Record & Builders’ Guide mentioned on April 13, 1918, “Hiss & Weekes were the architects.” Generations later the Landmarks Preservation Commission would credit Brite & Bacon with the design. Whoever was responsible, the result was striking. In 1899 the five-story neo-Jacobean residence was completed. The regal composition was distinguished by a two-story bay of leaded casements that supported a carved-stone balcony. The brick and stone façade culminated in a decorative parapet that hid the fifth floor from the street. Although the mansion was a commodious 30-feet wide, an areaway between it and the property at the Fifth Avenue corner allowed the luxury of windows in the western wall. Hudson and his wife, the former Sara Kierstede, had four sons: Percy Kierstede, Hans Kierstede, Charles Alan, and Hendrick. With no daughters in the house, Sara Hudson was relieved (or deprived) of debutante entertainments. She was highly visible, however, in the charitable events and causes expected of Manhattan socialites. The family spent the summer seasons at its country estate at East Norwich, Long Island. The family was doubtlessly embarrassed when Charles Hudson’s name appeared in newspapers for a physical confrontation on the floor of the Stock Exchange on March 5, 1900. When a “telephone boy,” Florence E. Finnegan, upbraided Hudson for selling sugar below the price he was given, trouble ensued. Hudson was suspended from the Exchange for 30 days—the maximum penalty possible. The wealthy family of Mr. and Mrs. Charles M. Lea lived in Philadelphia; but as their daughter Majorie Vaughan Lea approached marrying age, they spent more and more time in New York City. Marjorie’s debut into society took place in New York the same year that Charles Hudson had his skirmish with the young Finnegan boy. Marjorie and her parents spent the following winter season in New York; and by October 1902 she and Percy Kierstede Hudson were engaged. That same month Charles Hudson purchased a new private carriage house at No. 178 East 73rd Street. Less than eight years later the remaining Hudson boys would begin leaving home. In May 1910 Hendrick was married to Helen Morgan Frith. Five months later on October 14, the engagement of Hans to Ethel Le Roy De Koven was announced and Charles’ wedding to Eleanor Granville Brown would soon be in the planning stages. 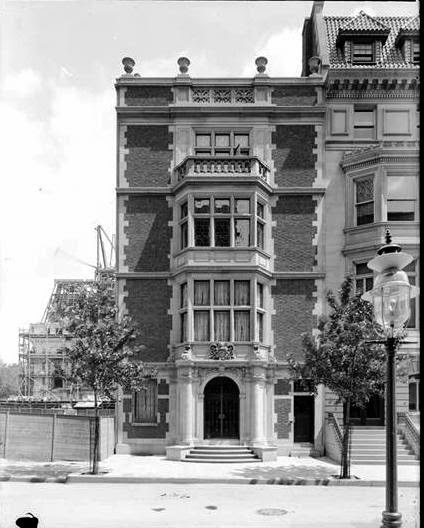 Perhaps it was their sons’ impending marriages that prompted Charles and Sara to sell their impressive mansion in May 1910--or it could have been the construction of the newly-completed J. J. Wysong mansion on the Fifth Avenue corner that prompted the sale. As the Wysong house went up, the Hudsons lost their view “overlooking Fifth avenue” that the Record & Guide had noted. Whatever the reason, on May 15, 1910 The New York Times reported that Hudson had sold the house for $300,000—a satisfying $7 million by today’s standards. The purchaser was Robert Franklin Adams. With the construction of the Wysong mansion, the house numbers along the 76th Street block changed. Rather than take the prestigious Fifth Avenue address, the new mansion took No. 1 East 76th Street. That meant that the Hudson house became No. 3 and so forth down the block. Adams was Vice President of the Adams Manufacturing Company. A member of the exclusive University, Lotos and New York Yacht Clubs; the motorcar enthusiast was also a member of the Automobile Club of America. A year after purchasing the house, Adams’ shiny limousine would be the victim of a runaway horse and cart. On April 8, 1911 a horse attached to an ash cart was spooked in front of No. 36 West 52nd Street. The driver was thrown from the cart and the panicked horse galloped onto Fifth Avenue, “narrowly missing several carriages,” reported The New York Times the following day. “As the runaway tore down the avenue there was a wild scampering of autos and other traffic,” said the newspaper. As the horse tore down Fifth Avenue with the ash cart careening behind, it approached Robert Adams automobile parked at the curb at 46th Street. “The horse tore the running board from its side and threw out the chauffeur, Charles Bender.” The collision slowed the animal enough that mounted Patrolman Plagge was able to get the horse under control. Adams and his wife, the former Lona O’Brien, had two children, Edith and Robert. While Sara Hudson had no opportunity to throw debutante entertainments, Lona Adams would. Edith’s coming out was celebrated in 1913 and the entertainments ended with a reception in the house on December 30. Three years later on February 2, 1916 Edith was married to Jules Glaenzer in St. Thomas’s Church on Fifth Avenue. The wedding would be followed by “a large reception,” according to The New York Press two weeks earlier. The following March Edith was back in the 76th Street house for the birth of her baby. In 1917 the wealthy were most often still seen by doctors in their private homes; rather than hospitals and clinics. In May Robert Adams Glaenzer was born in his grandparents’ mansion. Only a few days later the engagement of Robert to Jennie Frances Marston was announced. As with the Hudson family, perhaps the childrens’ leaving the house was cause enough to sell. Adams sold the house for $225,000. In 1929 No. 3 East 76th Street was owned by Mrs. Dorothy G. Pagenstecher. I. N. Phelps Stokes had recently purchased the ten-story apartment building at No. 952 Fifth Avenue, around the corner. On April 28, 1929 the New York Times reported that he had bought the Pagenstecher mansion “to protect the light of the apartment house.” He paid Dorothy Pagenstecher $200,000 for the property. Isaac Newton Phelps Stokes was not merely the son of fabulously wealthy Anson Phelps Stokes; he was an architect and partner in the firm Howells & Stokes. At the time of the purchase he had just completed the authoritative 6-volume work entitled The Iconography of Manhattan Island. He had married Edith Minturn in 1895 and the couple was immortalized by one of their wedding gifts--a double portrait by John Singer Sargent. On December 27, 1931 Stokes transferred the title to No. 3 East 76th Street to Edith. The mansion was converted to apartments—two each on the first four floors and a penthouse on the fifth. The upscale apartments were home to equally-upscale tenants for decades. Somewhat unexpectedly in residential design, the date of construction was carved within the ornately-carved Jacobean-style cartouch. Then in 2004 the Hudson mansion was purchased by the Hewitt School and converted to classrooms. The private girls’ school uses the house as its “lower school” for grades kindergarten through 4. Despite its current use and expected alterations—the wonderful bronze entrance doors are gone, the first floor window has been converted to a doorway, and the servants’ entrance now contains a rather commercial-looking door—the wonderful and unusual neo-Elizabethan house is greatly intact. A very attractive facade and what a magnificent neighborhood and period to live in when such incredible mansions were being built. That enormous roof under construction in the background of photo 1 is for the equally immense Senator Clark mansion at 5th and 77th Streets. Brite & Bacon were most likely the architects. Drawings for the house were pictured in The Brickbuilder for July 1899, plates 50 and 55, and a photo on page 143, under the Brite & Bacon name. Hiss & Weekes did later work for Hudson.